Belton's Chase King pitches against Temple on Friday at the Belton High School baseball field. 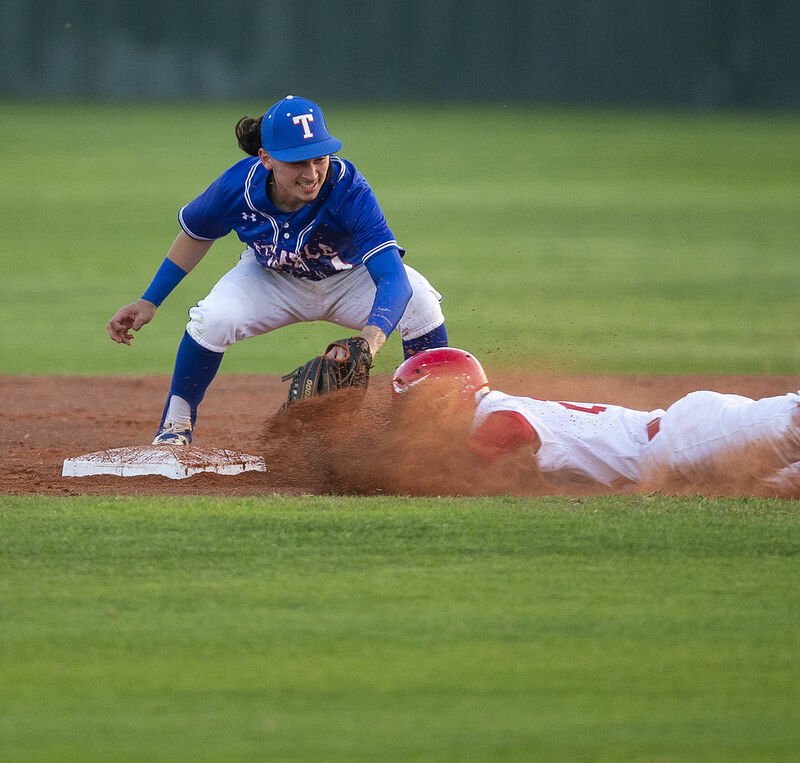 Temple's Xavier Aviles, left, tags out Belton's Gunner Garrett as he tries to steal second base Friday at the Belton High School baseball field. Temple’s Xavier Aviles celebrates after tagging out Belton’s Gunner Garrett (21) as he tried to steal second base Friday in Belton. 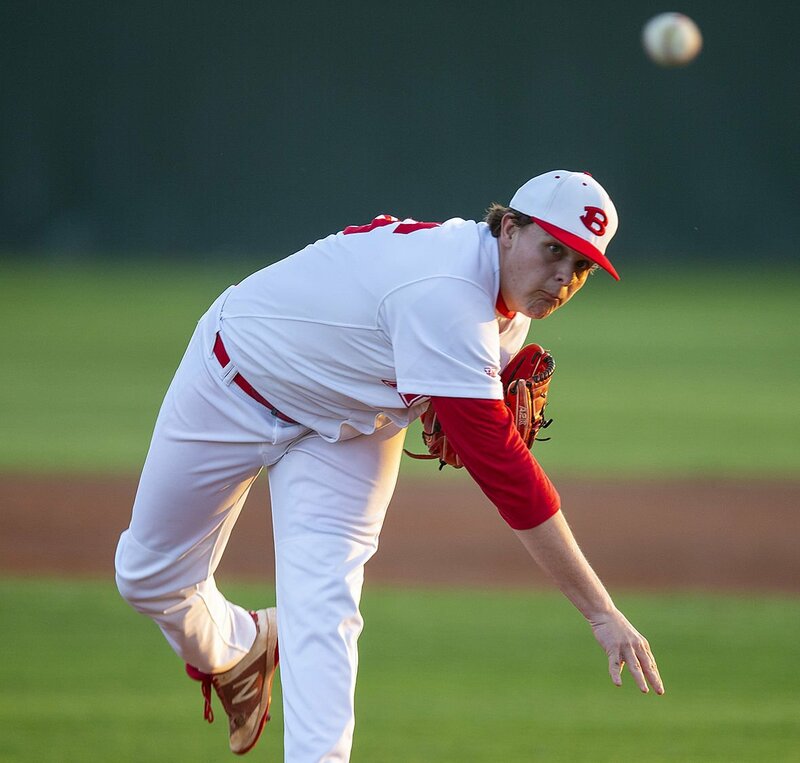 BELTON — Chase Fentress smashed a walk-off line drive single to left to score pinch-runner Coby Trovington with one out in the ninth to lift the Belton Tigers to a 2-1 victory over Temple in a District 12-6A baseball game Friday night at Tiger Field. Chase King went the distance on the mound for the Tigers in a stellar six-hit effort with just two walks to wriggle out of several Wildcat scoring threats. The No. 16 Tigers (19-4-1, 9-0) remain atop the district standings one game ahead of Midway. Temple drops to 8-14-1 overall and 4-5 in district. The teams were scoreless into the fifth when the Wildcats took the lead. Isaiah Fach drew a lead-off walk, was sacrificed to second by Brian Williams and went to third on a flyout. Corey Goynes was issued an intentional walk to put runners at the corners. The Wildcats executed a double steal with pinch-runner Dylan Hinkle scoring to put Temple up 1-0. Belton matched that run in the bottom of the sixth. Connor Carothers walked and was moved to second by Ben Jones. Carothers scored after Cooper Babcock hit a chopper in front of home plate. Catcher Gabe Garza’s throw went wide of first allowing Carothers to come home and make it 1-1. Temple placed a runner in scoring position in the seventh, but was unable to convert. Belton also stranded a runner in the seventh to force extra innings. Zach Alexander, the Tigers’ No. 9 hitter, slapped a one-out single to left in the Belton half of the ninth. A wild pickoff throw by Wildcats’ relief pitcher Aaron Wagaman allowed pinch-runner Trovington to reach third base. Fentress followed by stroking 1-2 pitch through the left side of the infield to win it for the Tigers. Temple, in one of its best district performances, had a solid outing from starter Corey Goynes who pitched the first six innings for the Wildcats and gave up just four hits. Wagaman took over for Goynes to start the seventh. Temple’s Xavier Aviles was only player to deliver multiple hits in the game with singles in the second and seventh innings, respectively. It was the first game of the second half of district play. Belton won the first meeting at Hallford Field 8-1 in February.